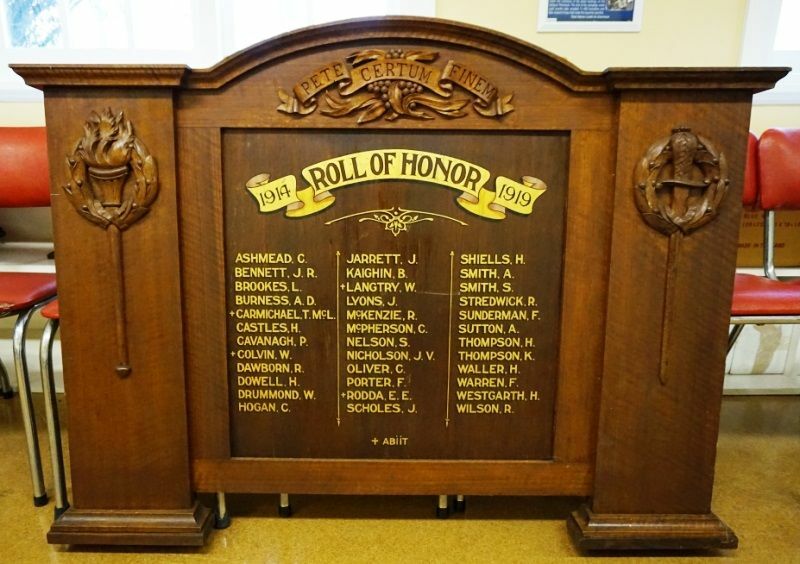 A wooden honour roll commemorates past teachers and pupils of the school who served in World War One. A trinity of events took place at the Benalla High School last Saturday afternoon, where there assembled a large gathering to witness the opening of the new class room which has just been completed at a cost of £755, the unveiling of a school honor board to past teachers and pupils who served in the Great War and to assist in the success of a fair to liquidate the debt incurred by the purchase of a new piano. After a musical item, the chairman spoke of the noble example shown by the past teachers and pupils whose names appeared on the honor board which they were about to unveil. He called upon Misses Muriel Knox and Marjory Walsh to perform this honorable ceremony. North Eastern Ensign (Benalla, Vic), 24 October 1919.